Shortly before 9 a.m. on a Tuesday, Burlington's incoming superintendent of schools was chatting amiably with a sleepy-looking teenager in Milton — not the Chittenden County town, but the fast-growing suburb of Toronto, Canada. In a crisp charcoal suit with a lavender shirt and matching silk tie, Yaw Obeng flashed an oversize smile as the T-shirted teen explained his post-graduation plans. The young man told 45-year-old Obeng that he planned to attend a local college, and maybe train to be a plumbing and heating systems installer. As Obeng explained later, it marked a major turnaround for the student, who had previously been in trouble with the law. "Take care, eh?" Obeng said, sounding thoroughly Canadian as he walked out of the alternative Gary Allan High School, through the parking lot and into the driver's seat of his sparkling white Lexus. Obeng said he makes a point of visiting schools as often as he can, even though his teaching days are behind him. Teacher salaries are a thing of the past, too. 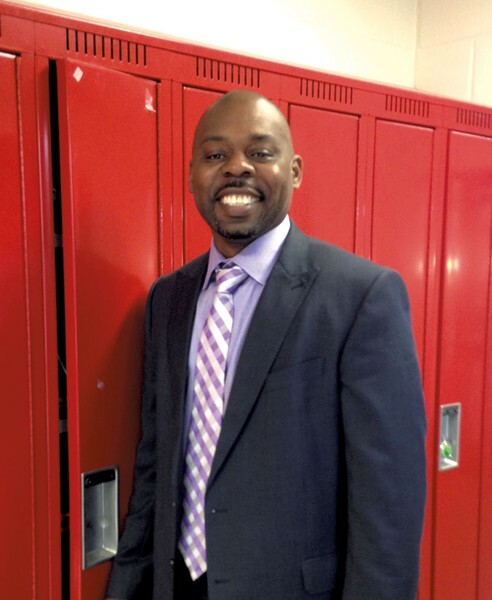 As a superintendent of the Halton School District, Obeng earns $170,000 a year in Canada; in Burlington he'll make $153,000, which, with the exchange rate, works out to be a sizable raise — and more than any other Queen City superintendent has ever received. Obeng was supposed to start work in Vermont on July 1, but his visa might not be in hand by then, according to interim superintendent Howard Smith. The law requires that the school district petition for the visa on Obeng's behalf. So far the district has spent around $8,000 on lawyers and fees to pursue two different kinds of visas, in hopes that one of them comes through: a temporary worker visa good for up to three years; or a "specialty worker" visa that would allow Obeng to work in the U.S. for up to six years and seek permanent residency to stay longer. If it's the latter, Obeng could not start work until October 1. In Burlington, Obeng will have his work cut out for him. The district is striving to erase chronic budget deficits, close student achievement gaps, and better serve immigrant and refugee students who have grown to represent about 13 percent of enrollment. Former school superintendent Jeanne Collins was essentially ousted last year with a $225,000 contract buyout. Several other central office administrators, including the business manager, decamped around the same time, contributing to a sense of instability at the top. In 12 years as superintendent, Collins led the district through an ambitious building renovation campaign, launched two magnet schools, and beefed up foreign language and music programming in response to parent campaigns. She was pressured to resign when controversy mounted over fiscal problems and other challenges, including a failure to meet district goals to hire more diverse faculty and administrators. Obeng will be Burlington's first black superintendent, a significant development in a district that has had few leaders of color. He said he understands from growing up in Toronto schools with few black teachers and principals what it might mean for Burlington students of color to have a superintendent who looks like them. "I understand the level of comfort," he said, and that it might provide "a little bit of hope and encouragement that yeah, it's possible." People who know and admire Obeng in Canada predict that he will be well equipped for the new challenge. Among other qualities, he has a stomach for political turbulence, said Donna Danielli, a Halton District school trustee who has watched Obeng in action since 2006. She remembers one disastrous public meeting that attracted a couple hundred unhappy parents. Rapid population growth had prompted the board to propose redistricting that would have moved their children to new schools. "I didn't think we were going to get out of it alive," Danielli recalled. Obeng helped lead the community forward by prioritizing the interests of students and understanding political sensitivities without playing politics, Danielli said. People need the opportunity to be heard, especially in a conflict, said Obeng. "We know we can't make people happy all the time, but one of the things we can do is listen," he said. Burlington looks very different from where Obeng is now. The enormous Halton School District, in which Obeng is one of six superintendents, has 61,000 students and 116 schools and covers five municipalities — including, coincidentally, Burlington, Ontario. Obeng is in charge of 27 schools. As he zipped around in his Lexus with a reporter on board, there were countless signs of rapid growth. Bulldozers were plowing up farm fields for new townhouse developments. The highway to nearby Pearson International Airport bloats to 16 lanes and still can't accommodate rush-hour traffic that slows to stop-and-go. Some spaces remain open, including the distinctive shelf of land known as the Niagara Escarpment, and Lake Ontario forms a vast sheet of uncluttered blue along one side of the district. But land is at a premium in the sprawling greater Toronto area, which is home to more than 6 million people — 10 times the population of Vermont. Obeng's district sprouts about two new schools a year and still can't keep up with the influx of children: Portable classrooms sit next to the playground at brand-new schools. School boundary lines have changed so often due to crowding that some students currently in fifth grade have attended five different schools, Obeng said. By comparison, Burlington has 4,000 students and nine schools, not counting alternative programs, and school enrollment has been flat. In the rest of Vermont, the number of school-age children has been steadily declining. The Halton system has a lower poverty rate than Burlington, where almost half of students qualify for free and reduced lunch, but it has some similar complexities. There are pockets of subsidized housing and generational poverty, along with students who live in 5,000-square-foot mansions overlooking Lake Ontario. That's not so different from Burlington, where children who live in homeless shelters sit in classrooms alongside peers who live in $600,000 Victorians. Both systems have a significant population of immigrant students, although Halton tends to attract many second-wave immigrants who have lived in Canada for some time. Burlington, meanwhile, is a hub for the Vermont Refugee Resettlement Program and as such is often the first stop for families arriving directly from Nepal, Somalia, Sudan and other countries. So how did little Burlington attract a big metro school administrator? Obeng said he and his wife had checked out the city on vacation a few years ago and liked what they saw. He was ready for change and threw his résumé into the pile accumulated by a search firm that brought him to interview in Burlington. According to Kyle Dodson, a Burlington school board member and parent, Obeng aced that interview — and other tests. There was nothing put-on or contrived in Obeng's rapport with students, and he also did very well with faculty, Dodson said: "People just seemed to feel an authenticity while also a gravitas." In fact, Obeng fit the bill so well, the school board offered him the superintendent job with an annual salary of $153,000 — $23,000 more than Collins took home. His three-year contract includes a provision for a bonus "based on exemplary performance" as determined by the school board and allows $6,000 for moving expenses and permission to collect outside fees for speeches and other appearances. Another deal sweetener: A city ordinance that requires department heads to be legal Burlington voters has been waived — until 2018 — for Obeng. Even acting superintendent Smith is accommodating his permanent replacement. Although his contract expires at the end of June, he told Seven Days that he would be open to extending his work for the district if Obeng's start date is delayed. Obeng calls himself "a citizen of the world" with "a close connection to Toronto." Although both of his parents hail from Ghana, he was born in Erlangen, Germany, where his father, a chemist, had gone to further his studies. The family returned to Ghana when Obeng was a baby and lived in the capital of Accra until he was 6 or 7. He spoke Twi at home and also learned English, which is the official language of Ghana, a former British colony. Seeking opportunity, his family moved to the United States, living in New York and Maryland before moving to Toronto when Obeng was about 10 years old. Adapting to life in North America was challenging at times, and as an immigrant child, Obeng said, he felt a "tremendous cultural clash." He added, "People were not always accepting of differences." Obeng believes his background helps him relate to immigrant and refugee families who are unfamiliar with the ways of a new country and new school system, and might arrive with distrust for institutions. "Someone like myself who has a similar background, you get a certain level of trust so that you can open dialogue and find out what the needs are," he said. Obeng's parents were educated, but they struggled in their adopted country, and money was tight. Despite growing up in lower-income Toronto neighborhoods, Obeng said he never felt deprived but "just knew I had to work hard to give myself opportunities for the possibilities out there." As a boy, Obeng was one of those children who walked eagerly through the school doors every morning. "I always liked school when I was a student, and being around school," he said. Science was a favorite subject, and initially Obeng thought of following in his father's footsteps to pursue a career in chemistry. A conversation shortly before graduation changed everything. "I remember one day sitting in the gym with my coach, who also was my mentor, and he was like, 'What are you going to do?'" The coach asked Obeng if he'd thought about being a teacher. By the end of the talk, Obeng had decided to pursue a career in education. He earned his bachelor's degree at the University of New Brunswick and along the way met his wife, Nancy Obeng. She grew up in Canada and has family from different parts of the country, which Obeng said has contributed to his cultural education. "It's been fabulous, eye-opening," he said. "My family itself is quite diverse." Nancy Obeng is white, and the couple has three boys — now ages 18, 15 and 14. The oldest boy is heading to college in North Dakota on a football scholarship in the fall, while the two younger brothers will follow their parents to Vermont and start at a new high school. Obeng told Seven Days that he and his wife are looking for a home in Chittenden County, and Burlington is their first choice. In raising his own family, Obeng said he has acquired a deeper understanding of the nuances around race and ethnicity. "It's been eye-opening in terms of helping me in my work," Obeng said, adding that it's helped him "support students like my children who come from multiple backgrounds." After graduation, Obeng entered a tight job market and was lucky enough to land a temporary teaching job at Elmbank Junior Middle Academy, one of the schools he had attended growing up in Toronto. When the teacher for whom Obeng was filling in decided not to come back, Obeng's colleagues wrote a joint letter of recommendation to the school board asking that Obeng get the job. The board agreed. "I still have that letter," Obeng said. As a young teacher, he was determined to live up to the expectations of the Elmbank faculty who supported him. "It was a challenging school," Obeng said. "It was a tough area, but you got back what you gave." By age 30, he had worked his way up to the principal's office at a different city school and earned a master's degree from the University of Toronto. In 2006, he moved to the Halton district, where he helped set up a new welcome center for immigrant students and designed programming to eliminate bias in school — be it around race, gender, ethnicity or sexual orientation. 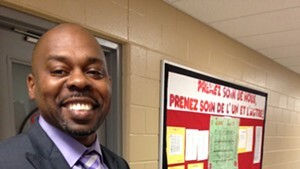 Irma Coulson Public School in Milton, a new school that opened on Obeng's watch about 18 months ago, specifically stresses equity and cultural sensitivity. Obeng has given the staff permission to try innovative approaches, said principal Merrill Mathews. "Yaw's fingerprints are on this place," Mathews said. Pending approval from immigration, Obeng is poised to make his mark on the next one. The original print version of this article was headlined "'Super' Man? Following the Next Leader of Burlington's Schools"